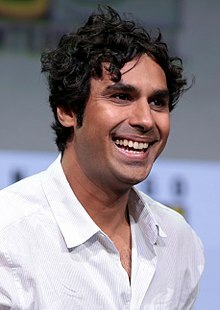 Kunal Nayyar (/kʊˈnɑːl ˈnaɪ.ər/; born 30 April 1981) is a British-born Indian actor and comedian known for his role as Rajesh Ramayan Koothrappali in the CBS sitcom The Big Bang Theory. According to Forbes, Nayyar was third on the list of world's highest-paid TV actors for 2015, tied with co-star Simon Helberg and with Mark Harmon and Ashton Kutcher, with earnings of US$20 million after The Big Bang Theory. Forbes again placed him third in its world's highest-paid TV actors list in 2018, his revenues rising to $23.5 million in that year. Nayyar was born in Hounslow, London, to a Punjabi family and was brought up in New Delhi, India. He attended St Columba's School in New Delhi, where he played badminton for the school team. His parents live in New Delhi. In 1999, Nayyar moved to the United States to pursue a bachelor of business administration in finance from the University of Portland, Oregon. Working on his degree, he started taking acting classes and appeared in several school plays. After participating in the American College Theater Festival, Nayyar decided to become a professional actor. He then attended Temple University in Philadelphia, Pennsylvania, where he received a master of fine arts in acting. After graduating, Nayyar found work doing American television ads and plays on the London stage. He first gained attention in the US for his role in the West Coast production of Rajiv Joseph's 2006 play Huck & Holden, where he portrayed an Indian exchange student anxious to experience American culture before returning home. In 2006, Nayyar teamed up with Arun Das to write the play Cotton Candy, which premiered in New Delhi to positive reviews. Nayyar made a guest appearance on the CBS drama NCIS in the season four episode "Suspicion", in which he played Youssef Zidan, an Iraqi terrorist. Nayyar's agent heard about a role for a scientist in an upcoming CBS pilot and encouraged him to audition for the part. This led to his casting in the sitcom The Big Bang Theory, where he plays astrophysicist Rajesh Koothrappali. In 2011, he co-hosted the Tribute to Nerds show with co-star Simon Helberg at the comedy festival Just for Laughs. In 2012, Nayyar voiced Gupta in Ice Age: Continental Drift. That same year, he completed the shooting of his first film, Dr. Cabbie, in Toronto, Ontario, Canada. The film was produced by Bollywood actor Salman Khan. From 5 May to 29 June 2015, Nayyar performed in an off-Broadway production, The Spoils, written by and starring actor Jesse Eisenberg. Nayyar played Kalyan, a Nepalese student and roommate of the protagonist Ben, played by Eisenberg. The production transferred to London's West End in 2016. In September 2015, Nayyar published a book about his career journey, Yes, My Accent is Real. He then voiced Guy Diamond in DreamWorks' animated movie Trolls, released in November 2016. Nayyar married Miss India 2006 winner, Neha Kapur in December 2011. They live in Los Angeles. 2013–2014 Sullivan & Son Sanjay/Neal Episode: "Ladies Night", "Sexual Healing"
2015 The Mindy Project Sendhil Episode: "While I Was Sleeping"
2017 Drop the Mic Himself Episode: "Mayim Bialik vs. Kunal Nayyar / Ashley Tisdale vs. Nick Lachey"
^ "The World's Highest-Paid TV Actors". ^ "Highest-Paid TV Actors 2018". Forbes. Retrieved 21 March 2019. ^ a b Banerjee, Sudeshna (7 July 2008). "Mr Big Bang". The Telegraph. Retrieved 21 October 2011. ^ a b Nayyar, Kunal (2015). Yes, My Accent Is Real: And Some Other Things I Haven't Told You. Atria Books. ISBN 978-1476761824. ^ Kapoor, Kritika (25 June 2010). "I'd rather do social movies: Kunal Nayyar". Daily News and Analysis. Retrieved 21 October 2011. ^ Ahmed, Sana (28 June 2008). "Going places". The Hindu. Retrieved 21 October 2011. ^ Successful Actors Talk About Their Training. backstage.com. Retrieved on 2012-11-17. ^ a b "Making it as a nerd". Rediff. 19 November 2007. Retrieved 21 October 2011. ^ Sahgal, Natasha (16 September 2009). "Geek God". Indian Express. Retrieved 21 October 2011. ^ Chander, Romesh (16 June 2006). "Staging the fluff of dreams". The Hindu. Retrieved 21 October 2011. ^ D'Arminio, Aubry (29 March 2016). "7 NCIS Guests Who Went on to Become Stars (PHOTOS)". tvinsider.com. Retrieved 5 May 2016. ^ Wyatt, Nelson (26 July 2011). "'Big Bang Theory' stars say most people can relate to being nerds". Winnipeg Free Press. Archived from the original on 14 September 2011. Retrieved 21 October 2011. ^ Brantley, Ben (2 June 2015). "'Review: 'The Spoils' Stars Jesse Eisenberg as Narcissist". New York Times. Retrieved 16 June 2015. ^ "The Talk, CBS". Retrieved 3 March 2012. 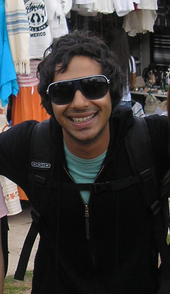 Wikimedia Commons has media related to Kunal Nayyar.